Announcement .All designs made by lil ol' me in my Newport Beach studio. Quality materials and attention to detail. All lengths can be altered to your liking. I make most of my own chains adding tiny Swarovski crystals at the clasp. .All designs made by lil ol' me in my Newport Beach studio. Quality materials and attention to detail. All lengths can be altered to your liking. I make most of my own chains adding tiny Swarovski crystals at the clasp. Gorgeous! I love it and wonderful service. Thank you! I've loved designing jewelry since I was a teenager. I used to go to a bead shop on Pacific Coast Highway in Laguna Beach and make beach themed jewelry for myself and friends. This carried on as a hobby until about 4 years ago. I took a class on wire wrapping. I showed it to a friend of mine who works in fashion, she told me that I REALLY have great design style and that I should sell my pieces. Voila, lunaCielo was born. Sometimes people think my name is Luna Cielo, it's Erin. I basically chose lunaCielo because I thought it sounded cool. A native Californian, we see Spanish everywhere. Luna means moon and Cielo means sky/heaven/ darling. I also speak pretty good Spanish, I lived in Barcelona for a few years. Each piece I make myself in my home studio. 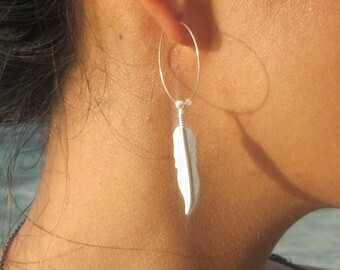 I use sterling silver and gold filled metal, Swarovski crystals, and various high quality components. I buy chain in spools of 100 feet (thus getting a great price to pass on to my customers/you!). I make my chains by cutting to desired length and wire wrapping the clasp. Most pieces I add little Swarovski crystals at the clasp. These quality details give lunaCielo Jewelry and upscale look that stands out above mass produced, cheap items. Some necklaces are then finished by simply adding a charm. Others involve much more design time which is always my pleasure! All jewelry is made by me, Erin, in my home studio in Newport Beach, CA. Lunacielo's necklaces are in gold filled and sterling silver in various lengths. My most popular items are my dangle disc necklaces- dangles are teeny tiny and really the nicest you will find, super pretty with their subtle glimmer. If you are not happy with your purchase I will accept returns minus shipping. Contact me through Etsy contact seller option within 3 days of receipt. I accept major credit cards through etsy direct checkout. Your info is safe and is not saved. I ship first class USPS WITH tracking included for the USA, Canada, and most EU countries. Other countries do not have full tracking, it will only show when your item leaves the US, contact me for full tracking upgrade. Standard shipping takes 3-4 days(USA) Priority shipping upgrade takes 2-3 days, usually 2.